Background: Parkinson’s disease commonly characterised as a neurodegenerative disease affecting the global population in the upper age limit affecting movement and is identified by stopped posture, shaking hands and frequent tremors. The difficulty in the treatment of the disease arises due to the fact that a considerable time lag exists between the onset of the disease internally and appearance of the disease symptoms. The symptoms of Parkinson's disease are caused by reduction in the levels of dopamine neurotransmitter in the brain due to nerve cell damage in the brain. Objective: The primary treatment of the disease aims to restore the proper balance of the neurotransmitters acetylcholine and dopamine by increasing dopamine levels. In addition to the dopamine agonists, several mono amino oxidase B (MAO-B) inhibitors, anticholinergics and Catechol- O-methyltransferase (COMT) inhibitors have also been proposed for the treatment of the disease. Method: Based on the need for searching target specific drug molecules with potential therapeutic efficacy, design of new chemical entities using recent approaches in the field of drug discovery has drawn attention of a wide group of medicinal chemist. 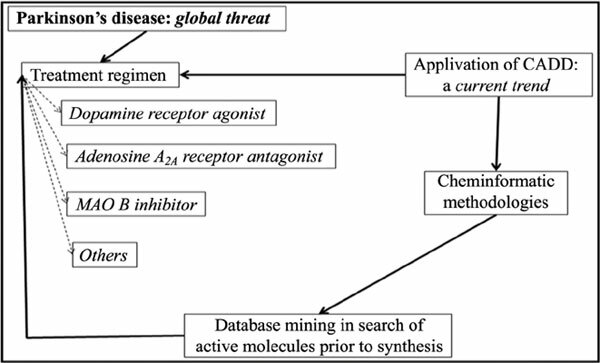 In this aspect, chemometrics proposing the concept of computer-aided drug design (CADD) has been adopted widely for the purpose of database searching and design of molecules with improved anti-parkinsonian potential. Results: In the current review, an attempt has been made to explore the CADD methodology in the field of drug discovery related to identification of molecules that may be utilised for alleviating symptoms related to Parkinson’s disease. Conclusion: The works reported by the different groups of authors further help in the identification of the biological pharmacophore of the anti-parkinsonian agents and determine their degree of interaction with the corresponding receptor. However, the literature search made in this review is an exhaustive one and other additional works have also been performed by other different groups of researchers in this field. Keywords: Parkinson`s disease, dopamine, CADD, QSAR, MAO-B inhibitor, adenosine receptor. Keywords:Parkinson`s disease, dopamine, CADD, QSAR, MAO-B inhibitor, adenosine receptor. Abstract:Background: Parkinson’s disease commonly characterised as a neurodegenerative disease affecting the global population in the upper age limit affecting movement and is identified by stopped posture, shaking hands and frequent tremors. The difficulty in the treatment of the disease arises due to the fact that a considerable time lag exists between the onset of the disease internally and appearance of the disease symptoms. The symptoms of Parkinson's disease are caused by reduction in the levels of dopamine neurotransmitter in the brain due to nerve cell damage in the brain.